Sequence valves control the sequence of operation between two branches in a circuit; that is, they enable one unit to automatically set another unit into motion. An example of the use of a sequence valve is in an aircraft landing gear actuating system. In a landing gear actuating system, the landing gear doors must open before the landing gear starts to extend. Conversely, the landing gear must be completely retracted before the doors close. A sequence valve installed in each landing gear actuating line performs this function. A sequence valve is somewhat similar to a relief valve except that, after the set pressure has been reached, the sequence valve diverts the fluid to a second actuator or motor to do work in another part of the system. 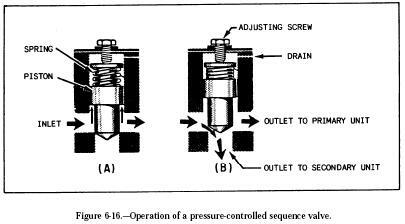 Figure 6-15 shows an installation of two sequence valves that control the sequence of operation of three actuating cylinders. Fluid is free to flow into cylinder A. The first sequence valve (1) blocks the passage of fluid until the piston in cylinder A moves to the end of its stroke. At this time, sequence valve 1 opens, allowing fluid to enter cylinder B. This action continues until all three pistons complete their strokes. There are various types of sequence valves. Some are controlled by pressure and some are controlled mechanically. view A). This fluid pressure also acts against the lower surface of the piston. When the primary actuating unit completes its operation, pressure in the line to the actuating unit increases sufficiently to overcome the force of the spring, and the piston rises. The valve is then in the open position (fig. 6-16, view B). The fluid entering the valve takes the path of least resistance and flows to the secondary unit. A drain passage is provided to allow any fluid leaking past the piston to flow from the top of the valve. In hydraulic systems, this drain line is usually connected to the main return line. 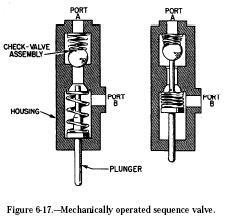 The mechanically operated sequence valve (fig. 6-17) is operated by a plunger that extends through the body of the valve. The valve is mounted so that the plunger will be operated by the primary unit. A check valve, either a ball or a poppet, is installed between the fluid ports in the body. It can be unseated by either the plunger or fluid pressure. Port A (fig. 6-17) and the actuator of the primary unit are connected by a common line. Port B is connected by a line to the actuator of the secondary unit. When fluid under pressure flows to the primary unit, it also flows into the sequence valve through port A to the seated check valve in the sequence valve. 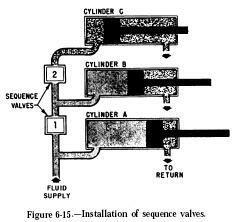 In order to operate the secondary unit, the fluid must flow through the sequence valve. The valve is located so that the primary unit depresses the plunger as it completes its operation. The plunger unseats the check valve and allows the fluid to flow through the valve, out port B, and to the secondary unit. This type of sequence valve permits flow in the opposite direction. Fluid enters port B and flows to the check valve. Although this is return flow from the actuating unit, the fluid overcomes spring tension, unseats the check valve, and flows out through port A.